Photo measuring approx. 5.5 x 3.25 inches. I have other photos of outdoor activities, including a set of camping photos that I’ll have to post, and it strikes me that the gear from back then looks so cumbersome. I don’t know if these folks have had any luck, but they look happy regardless. There’s something that strikes me as odd about the woman in the photo. She seems too modern and too clean compared with the fellers. You’re right about the gear – big and bulky, but made to last. I see what you mean. I am sometimes struck by elements of these photos that seem anachronistically modern. An outfit, a pose, or even just the surprising clarity of the image which makes it seem new. Sometimes I look at a face and think it just look like a modern face, which I realize is ridiculous. Even so, things sometimes stand out like that. As for this woman, her glasses seem of the right period, and her hair would probably be more recognizably period if she bothered to style it. She may be cleaner because she wasn’t actually mucking about in the river. Maybe she and the photographer just showed up. Who knows? To me she stands out because she looks like a woman I knew in college. Whatever the situation, she stands out, which is interesting, on top of an already (to me) interesting photo. The woman’s clothing is, I agree, much too clean for panning for gold! 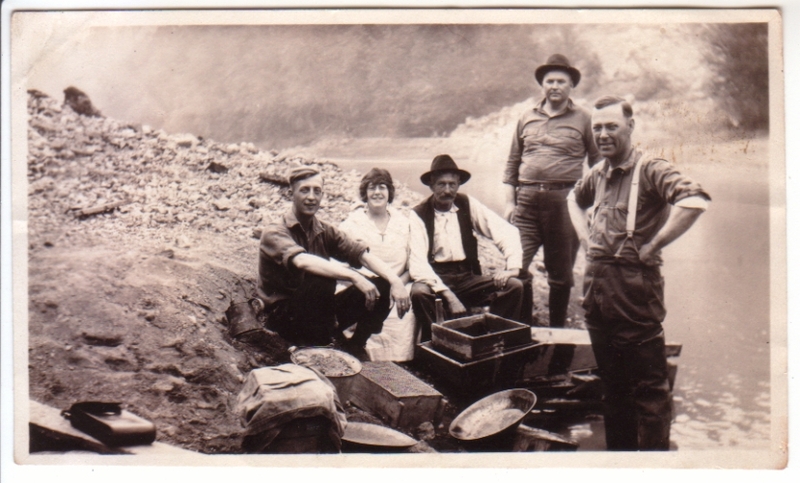 Her style also says “1920s” to me, so that’s not the California Gold Rush they’re panning for gold in … Maybe they were a bunch of city folks who wanted to go “gold panning” for fun, while camping, or something. But it looks like they’ve got a couple of pans and a sluice box ready to set up by the river, so maybe they did some actual panning after they posed for the photo? Oh, I hope I didn’t seem to imply that this was a Gold Rush era photo. That would practically pre-date photography altogether, and certainly a casual snap like this. I agree that 1920s sounds about right. And I agree that these are probably city folk on a weekend adventure. I have some other vintage camping photos, and the amount of gear they hauled in (enormously cumbersome tents, deck chairs, not to mention their clothes) implied that they would be willing to lug along this panning equipment, too. I do believe that they were actually panning for gold here, but I suspect it was for sport, rather than a primary source of income.